The Support of your office enabled us to provide much needed computers and televisions to families who did not have one. It warmed my heart to see the children and parents so happy. These donations help us carry-out our mission in helping families have access to donations that will help them prepare for a better future. Thank you so much Electronic Access Foundation for doing such a remarkable thing. I do not think you realize the impact that you have had on this community through you compassion to give back. My nonprofit organization is named in honor of my grandfather, Rev. 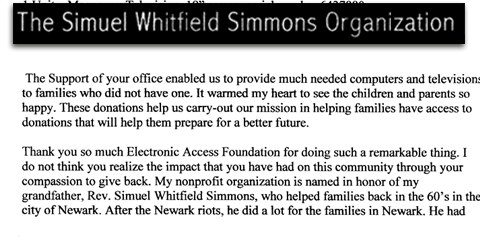 Simuel Wihitfield Simmons, who helped families back in the 60’s in the city of Newark. After the Newark riots, he did a lot for the families in Newark.